If you’re from Minnesota, you know that summer and cabins go together better than chocolate and peanut butter. For many people, going “up north” for the weekend is basically a rite of passage. But as entwined as cabins are to Minnesotans’ DNA, they don’t always have to adhere to rustic mountain decor. Cabins can (and should) reflect your personality. If you’re not into the traditional log look, why not opt for a smaller, simpler design instead? 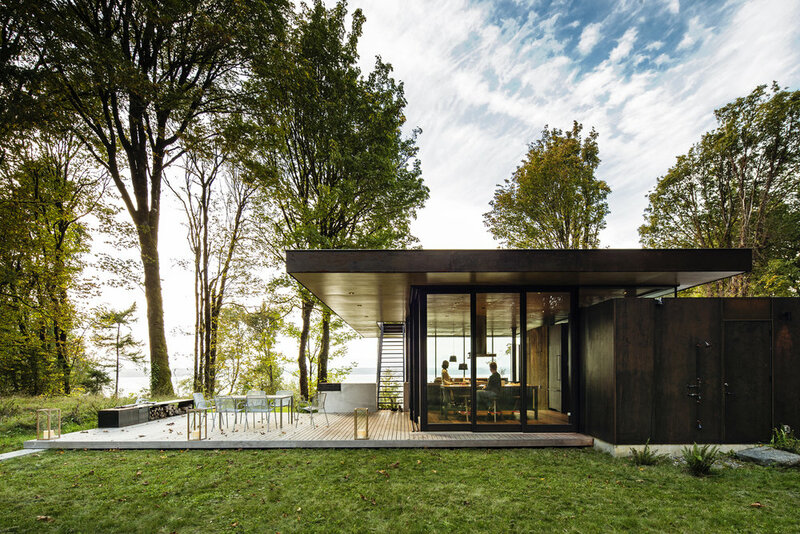 Modern cabins are on our radars big time right now, and with their sleek lines and minimalist décor, it’s no wonder why. They are sheer perfection. Gone are the days when having a cabin meant you had to have a giant stone fireplace. Today there are so many beautiful pared down fireplace designs to choose from that complement your space and truly make a modern statement. From unique wood burning stove shapes to using white painted brick or tile around the hearth, you can still soak up the magic of a cozy fireplace without falling back on the usual lodge set up. 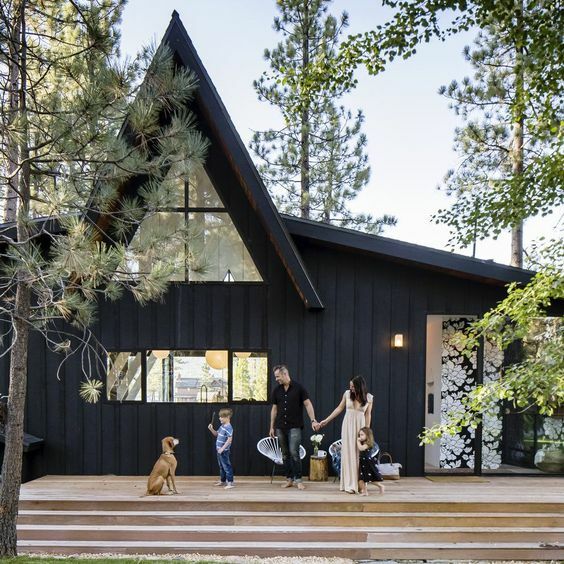 Modern cabins tend to stick to the neutral family, with bold blacks and crisp whites taking the spotlight. Incorporating color is great – but it’s best done in small pops here and there. If you keep your color scheme largely monochromatic, your space will feel much more contemporary and less likely to fall into the typical log cabin vibe (think heavy on reds and greens). Usually, firewood ends up being stacked in a corner of a cabin – sometimes on an outdated metal stand, and other times just stacked in any way that’s sturdy. But why not use wood storage as an excuse to get artistic and really utilize the space? 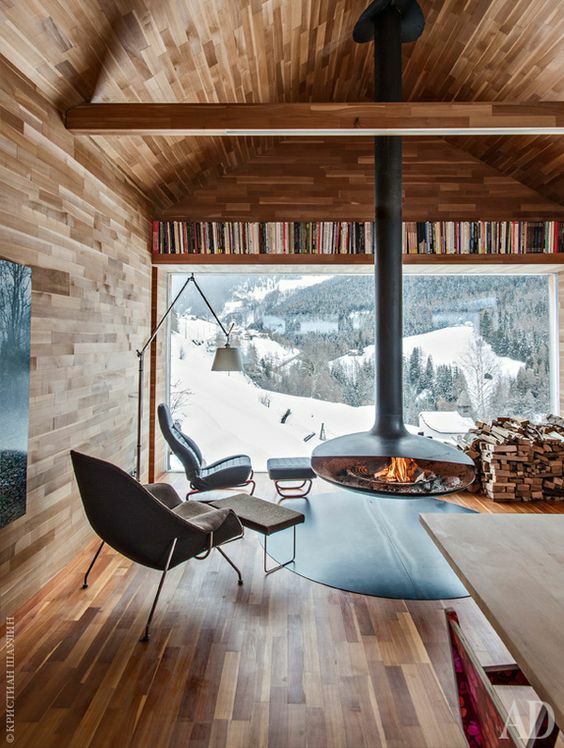 These gorgeous cabins make firewood look like the most show-stopping thing in the room. Try this look by incorporating built-in compartments by the fireplace (unused wall space, I’m lookin’ at you), or opt for a unique shelving unit that gives your cabin a modern flair. 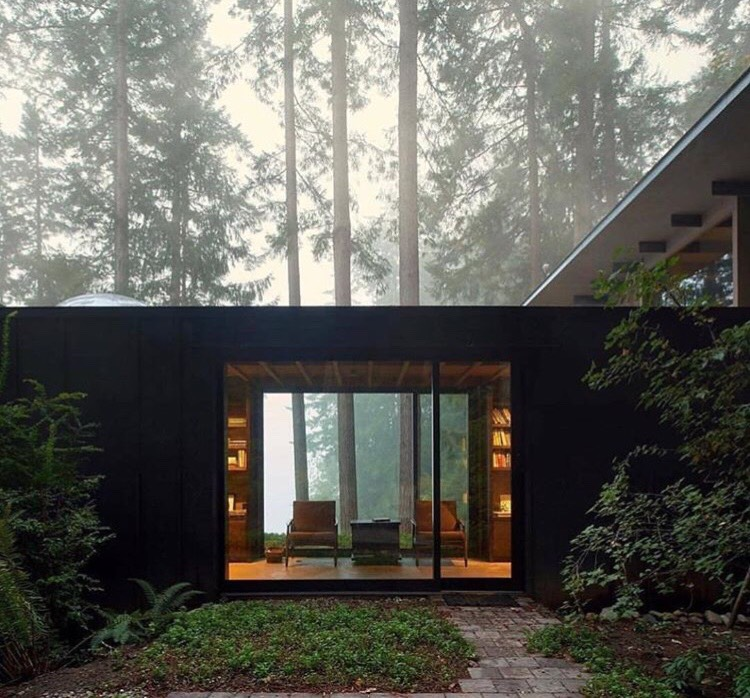 There’s nothing more stunning than a modern framed home nestled between pine trees. 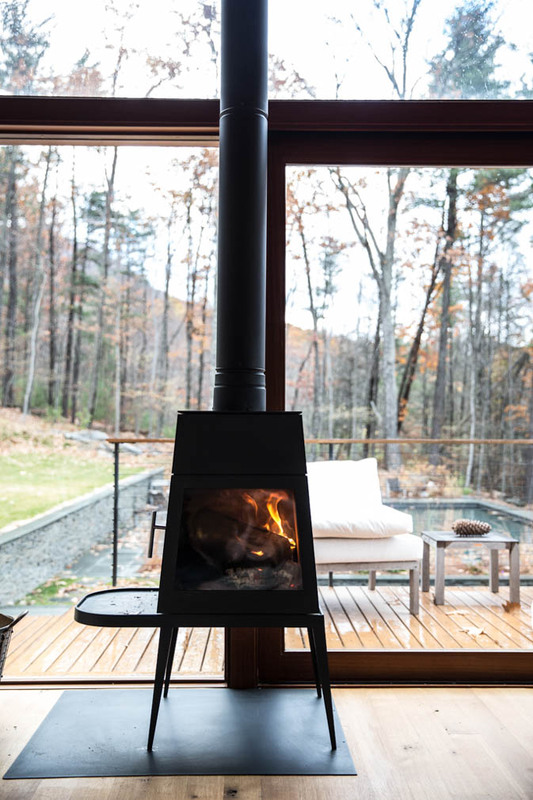 Modern architectural details can completely transform cabins into contemporary structures with purposeful connections to nature. Details like floor-to-ceiling windows that overlook a lakefront, A-frame structures with stunning loft bedroom views, and skylights that add natural light can all work together to help a cabin feel airy, open, and updated. You can still achieve a “cabin” feel with wood paneling or exposed timbers, but the trick to making this look feel more modern than mountain is to keep it understated and balance it out with simple furniture and neutral colors. 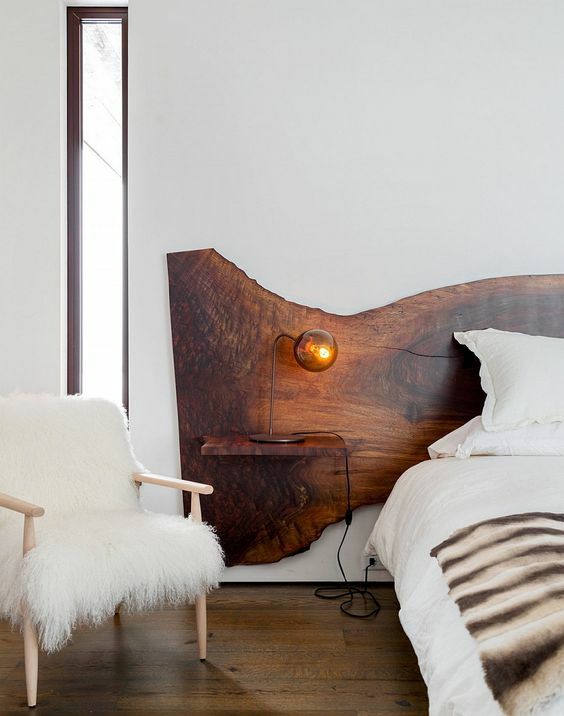 You don’t necessarily want to have an all-over wood-paneled room paired with wood furniture and accents because it can be visually overwhelming. But if you use wood sparingly, it can help you pull in inspiration from the surrounding trees in a way that is fresh and tasteful. Ready to take your cabin to the next level? Try incorporating some of these design tips for an modern take on a Minnesota classic. Your second home will instantly feel refreshed and ready for the summer (and your s’mores will taste better than ever).